Yesterday Satsavya, our Vice President, arrived at Faro Airport and today we went to the notary in Odemira to establish two more cornerstones of the Osho Garden Project. One entity is an Association with the same name as the Foundation but in another language and established in another country. Tuinen voor de Nieuwe Mens and Jardins para o Novo Homem both translate into Gardens for the New Man. The Foundation is the owner and guardian of the property, the Association is the not-for-profit organization of the community of all participants and of the meditation center. But as we also want to earn some income, by organizing organic gardening and related activities on a commercial basis, a third entity was established, the Agricultural Cooperative Savoy Gardens. As the name implies, it is organized as a Cooperative, which is an Association acting as a business. It was the first time in her career that our notary established one and Natália, our lawyer took a picture of us, the new no-management team of the Savoy Gardens not-a-hotel, or for short: Gardenotel. 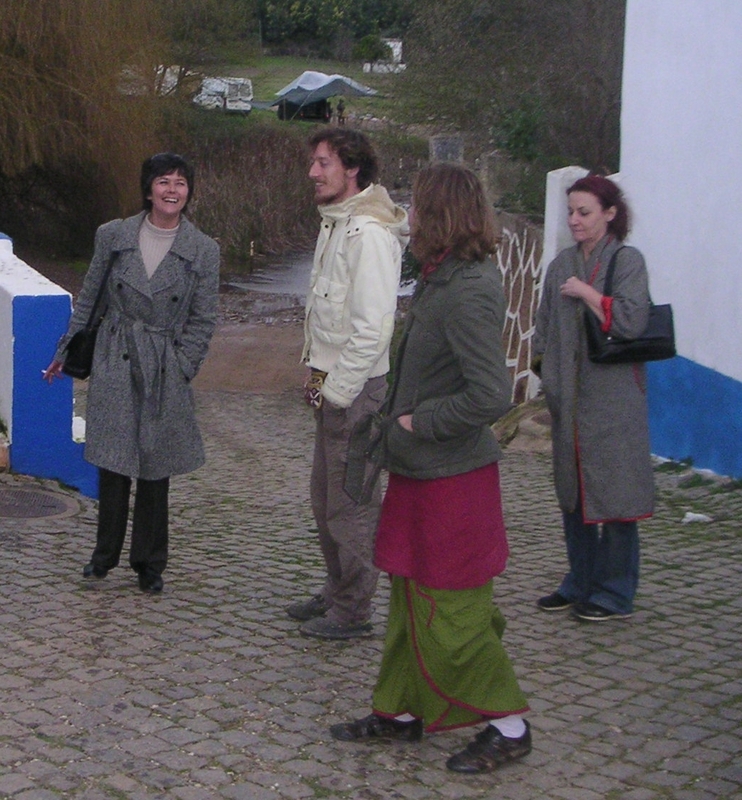 Today is Saturday, the electricians stopped their work at noon and we used the afternoon to explore Santa Clara-a-Velha, just five minutes from Sabóia on the other bank of the Mira. We were hungry as the work today even required the temporary dismantling of our emergency kitchen so we felt fortunate to find a busy restaurant in this small town. Pepe’s place is quite enjoyable and serves good food. After our snack lunch (we were late for actual lunchtime which starts at noon in this area) we had a date with Luisa, our Real Estate Agent, a.k.a. our Relationship Manager. She has quite a history with our project already as she helped to find the land and the house and today was helping to find rental rooms. Just as a precaution in case people come to visit us without their own caravans and before it is warm enough to live in a tent in the garden. The picture reveals her typical way of waving a cigarette around while informing everyone she knows what the problem is (with anything), but I wonder….. We found some nice rooms. If you are worried whether we meditate at all or are just having a good time, you are in good company. Or shall I say, you are in the company of a part of ourselves and of some mothers, girlfriends and sisters. Do you know why brothers, boyfriends and fathers don’t worry about this problem? It’s because they know the secret of the Power Meditation! Anudip, our Construction Supervisor is a Master of it, and if you happen to visit us he may instruct you. The Power Meditation has four stages. Stage one. You cook a breakfast from oats, apples, bananas and other goodies and meditatively consume it with a cup of coffee. Stage two. 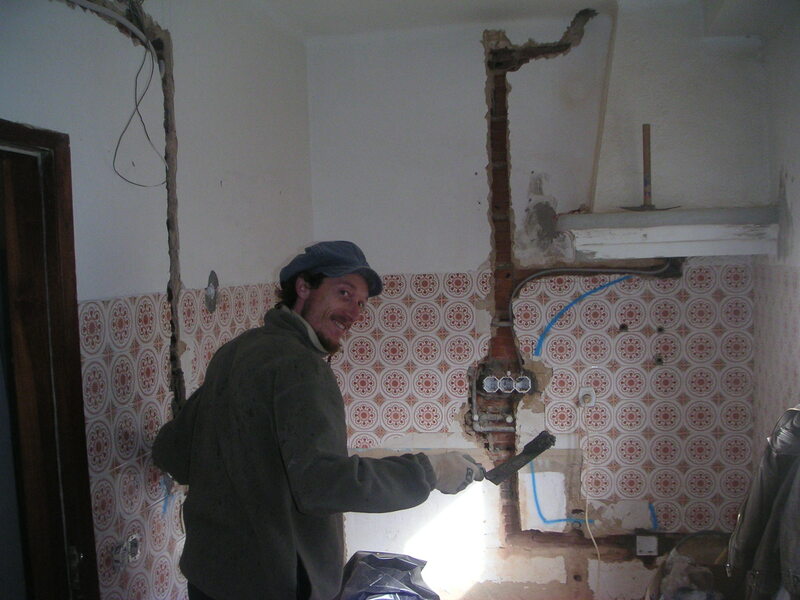 You can choose, either lift heavy cutting machinery or swing hammer and chisel to cut holes in walls. Stage three. You have coffee in silent sitting while the electrician puts the Power Cables into the wall. Stage four. You plaster the holes with cement again until it looks almost like it was before. As you can see it is a variation on Gurdjieffs technique of digging a ditch and filling it up again. Please look it up in the Book of Secrets and if you find it, tell me which number it is. And above all, don’t take me and this weblog seriously guys. Yes, we will soon start a full-scale Osho meditation program here, but meditation can also happen all day in all we do, if we do it with full awareness and enjoy every second of it. We are creating mainly shared facilities in the house, like a meditation room, a well equipped kitchen and some office space. But as a result there remains little room for personal accommodation. 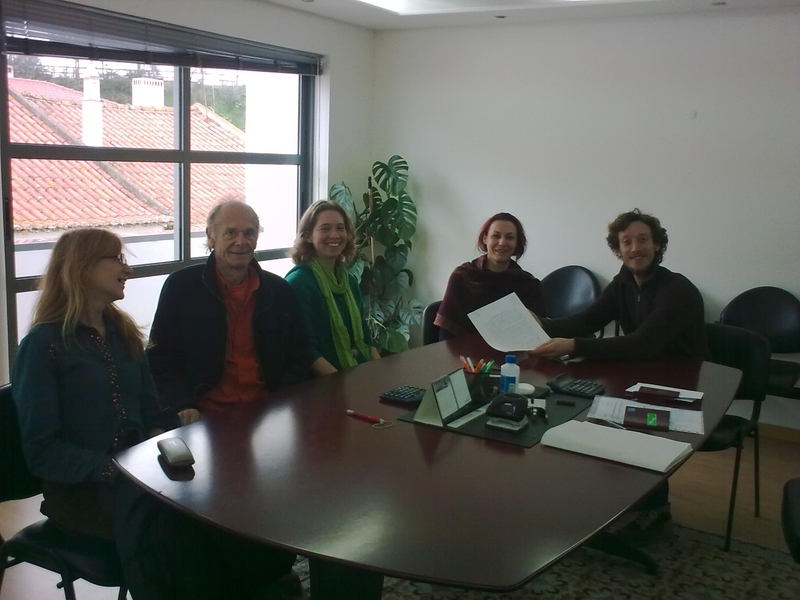 Today we went looking for temporary extra space in the town of Sabóia and found a room for Zumati, our Administrator. The house that we found has a friendly landlady, a nice view from the sunny roof terrace (pictured) and a beautiful bathroom. Moreover it is close to Ladeirinha, which is where she will be having her daily occupations anyway. So that’s the story for today: We will soon need more rooms and you can help us with it. If you are planning to come over to visit us and you are driving a car with a towbar it would be a real help if you could take a caravan. This time of the year it is definitely a better way to camp than in a tent. And don’t worry about driving it back. We would like you to leave it behind, either for your next stay or else someone will take it over. There is an urgent demand for it. Deepika, our new Chef de Cuisine arrived a few days ago when the old kitchen had just been demolished and the new one was still under construction. But she is doing miracles in our emergency cooking corner in the office, which is serving as our dining room at the moment. We are living in a dust cloud at times, when Bas or Frank of the construction crew is using the grinder or Anudip is cutting holes in the Taipa wall for the new electricity meter that must be installed. But as you can see we keep smiling amid all this inconvenience. Maybe because we know that this too will pass, and then we will remember it as a great adventure! The existing kitchen served the former inhabitants for 30 years but was too small and outdated for a cuisine de Notel. 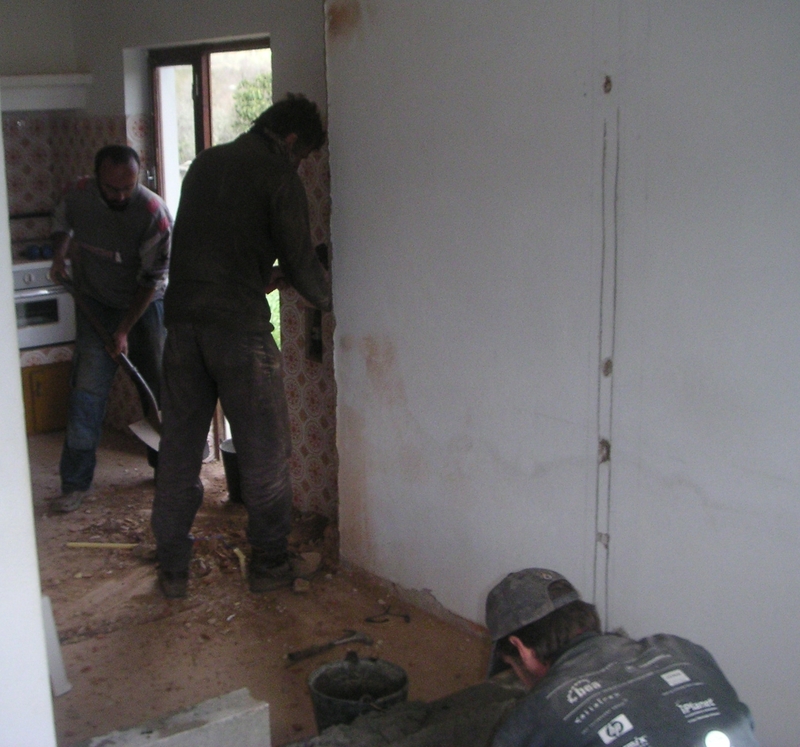 So today we took a wall down and now we are building another, creating more kitchen space. Meet our construction crew, today consisting of Frank, Bas and Marcos. 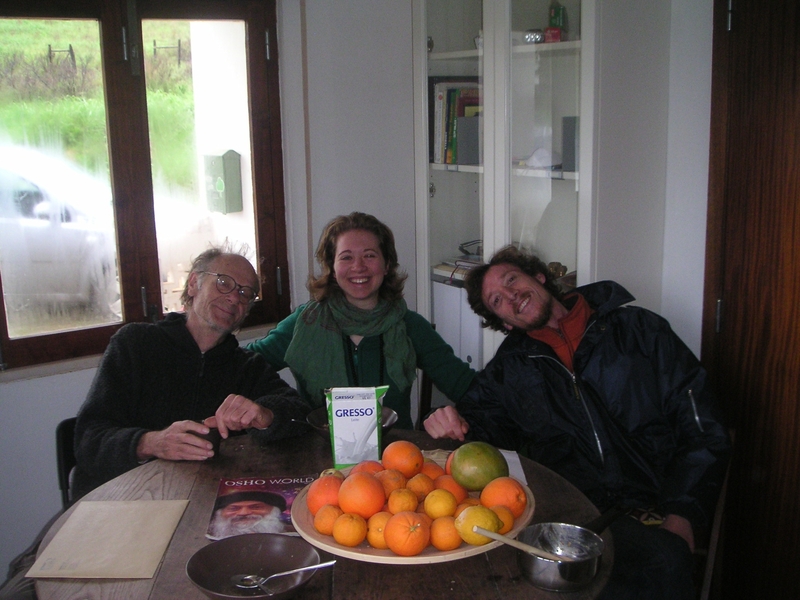 Frank and Marcos started a commune last year with some friends on 8 ha of land near Tamera, also in Odemira county. They are with 10 people now. 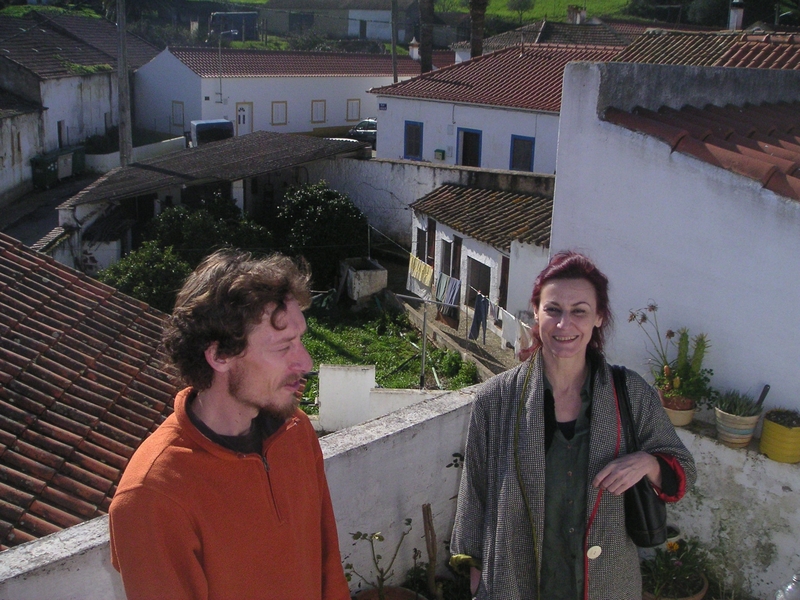 Bas lives in Amoreiras Gare, not far from Prembodhi and Navino. They are also involved in Permaculture, organic food, Taipa building and solar energy and we are looking forward to work on all kinds of projects together. Today as I was driving through the Alentejo landscape I took the picture below. Compare it to the head of this blog. Little did I know when I selected this blog theme – called Greenery – last year that it would look so strikingly similar to the region where we finally landed. There has been a lot of rain this year and the river behind our Savoy Notel (Not-a-hotel) has plenty of water. The sun is out, it feels like spring. A good time to open the Osho Garden doors and allow some Dynamic energy to enter and transform our lives!